Chiropractor Boosts Brandwith Frosted Vinyl and Lobby Sign! 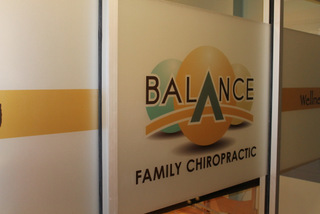 Balance Chiropractic Continues Branding with Frosted Vinyl and Lobby Sign! Just the other day, we introduced you to Balance Chiropractic. Dr. Robin Ackerman and her friendly staff provide expert pediatric and adult chiropractic care to Bartlett’s residents. When the office’s management team decided it was time to get some window graphics that would generate interest in the family chiropractor’s services, the nice folks contacted Mark Your Space. Well, when it came time to add a lobby sign as well as some interior vinyl graphics, they called us back. We did a modern lobby marker that highlights the company’s name and logo. This makes branding and name recognition a snap! The lobby marker is offset mounted so that proper illumination will yield attractive shadowing on the focal wall. The frosted vinyl and lobby sign continue the branding message and add some definition to the attractive office space of this professional. Is it time to brand your Bartlett, IL, business with vinyl graphics and matching lobby signs? There is something to be said for the use of matching graphics that brand throughout your space. Harmonious use of ad space. Within your office, there is plenty of marketing space. You may not realize it, but there are options that go beyond the magazine racks and flat literature that you keep readily available to clients. 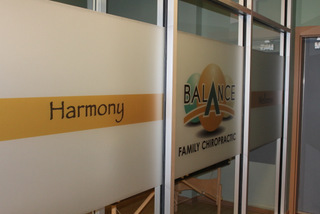 Balance Chiropractic made great use of the focal wall as well as of the copious window panes within the office. Even if windows are at a premium in your setting, you do have plenty of wall space. Vinyl wall graphics are superior marketing tools for offices of all types. Branding in this manner ensures that all of your logo displays are identical, which results in a harmonious appearance. Refresh your space’s appearance. While the many glass panes may have initially attracted you to the office, the latest updates in interior decorating trends are now turning the glass into a bit of a dated look. There is no reason to spend a huge chunk of money on costly remodels. The addition of inexpensive window graphics adds definition to the space, introduces frosted or smoky glass appearances, and provides a great means of displaying your logo and company name. Stand out from the competition. Are you operating your business in an office park where numerous competitors are fairly close by? Do not allow a somewhat identical office setup to lead to mistaken identities. You want your hard-won clients to return to your office, not to the one of the competition that might be just a door or two down from you. Ensuring that your logo and company name are attractively worked into your interior decorating scheme ensures that these mistakes will not happen. As you can see, frosted glass vinyl and a matching lobby sign for Bartlett, IL businesses are smart ideas to turn a basically nice but nondescript office space into a lean mean marketing machine. When you are ready to achieve this look with the walls, glass panes and other design features that your office has to offer, contact the expert lobby sign professionals at Mark Your Space. We look forward to discussing your signage needs with you and providing you with the ideal setup that is sure to add some pizzazz to your location. 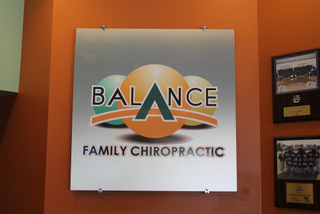 Title: Balance Chiropractic Continues Branding with Frosted Vinyl and Lobby Sign!